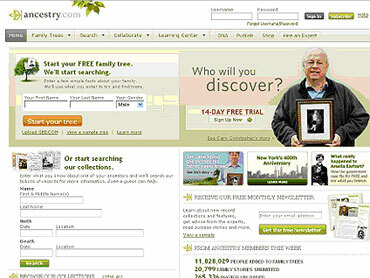 Genealogy Web site Ancestry.com hopes to raise about $100 million when it goes public this week. With more than a million paying subscribers, little competition, a small debt load and a record of increasing revenues, it may fare better than other IPOs that have recently priced below their filing ranges. The Provo, Utah-based company, which is the world's largest online resource for birth certificates and marriage records, expects to price the shares between $12.50 and $14.50 apiece on Wednesday. Underwriters are being offered up to an additional 1.1 million shares to cover overallotments, which would boost total proceeds to about $115 million. Five of the last nine IPOs have closed below their offering price in the first day. But experts say that shouldn't be the case for Ancestry because technology IPOs have collectively performed about twice as well as other sectors so far this year. The company is a profitable niche market leader and it's growth story will likely resonate well with investors, said Scott Sweet, senior managing partner at IPO Boutique, who is optimistic about the stock debut. "Currently they're alone out there, and for the time being their financials are showing it," Sweet said. "There is definitely strong demand for researching and building a family tree, and the people who do get involved with this really get deeply involved, going as far back as the software will allow them out of curiosity." Not only does the Web site make family history research less painstaking and time consuming, but it lets customers collaborate with other subscribers. That gives it the edge of a social networking Web site, Sweet said. Ancestry's revenue jumped from $122.6 million in 2004 to $197.6 million in 2008. In the nine months that ended Sept. 30, the company earned $12.2 million, or 30 cents per share, a more than threefold increase from the $3.5 million, or 9 cents per share, it earned in the same period a year earlier. Francis Gaskins, president of IPOdesktop, said on-demand software, or the "log me in" segment, has been strong during the economic downturn. Ancestry, which relies heavily on recurring revenue from annual subscriptions, has funded its growth through internal cash flow. "At first blush, some may think this looks like a high price-earnings ratio, but compared to other companies in the broadly defined segment it's a very attractive price," Gaskins said. It's unclear how large the potential market is for its products, however, because Ancestry is something of a pioneer in online genealogy, said Eric Guja, an analyst for Greenwich, Conn.-based Renaissance Capital. The company expects to expand overseas, but it hasn't gained traction internationally yet. Meanwhile, the average monthly subscriber churn rate, or the rate at which it lost customers, is relatively high at 4 percent, Guja said. Still, he expects the stock to do well. "This deal in particular will appeal to a specific kind of investor base," Guja said. "This is a unique company that's invested more than $80 million to build up its content, and it will continue to benefit from its large user base." About 45 percent of the shares will come from existing shareholders, the company said. Private equity firm Spectrum Equity Investors, through its affiliated funds, will own about 54.8 percent of the outstanding stock after the offering. Ancestry plans to use net proceeds of about $48.4 million for general corporate purposes and to repay debt. The company said it may also use a portion to expand through acquisitions or investments in technologies. Underwriters for the deal include Morgan Stanley, Bank of America-Merrill Lynch, BMO Capital Markets Corp., Jefferies & Co. and Piper Jaffray & Co. It will trade under the symbol "ACOM" on the Nasdaq Global Market. Founded in 1983 as Ancestry Inc., the company started out publishing books to help genealogy buffs research family lineage and moved to Web-based documents and tools. With more than 600 employees, Ancestry.com was spun off from The Generations Network, a group of businesses offering other Web tools, DNA testing services and Ancestry magazine. The president, CEO and director of the company, Timothy Sullivan, was president and CEO of Match.com, a dating site run by Internet company IAC/InterActiveCorp., before joining Ancestry in 2005.